60 won't suffice you have to battle till 100 to make it a century. 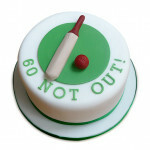 Send online these 60 Not Out Designer Cake using premium quality ingredients to the world cup fan lover on their Birthday. Let them sink their teeth into this outrageously delicious cake and relish each and every bite of this mouth melting cake to make it the most memorable day in times to come.